With in-situ liquid TEM you can study the dynamics of nanoscale samples in a liquid environment, and observe specimens in their natural state. This opens up a whole range of research possibilities – primarily in life science for observing biological cells, but also in materials, battery development, corrosion, semi-conductors, cancer research, structural biology and more. Blue Scientific is the official Nordic distributor for Protochips in the UK and Nordic area (Norway, Sweden, Denmark, Finland, Iceland). For more information or quotes, please get in touch. Traditionally it was difficult to study liquid samples in a TEM (Transmission Electron Microscope) because of the high-vacuum conditions necessary for capturing fine details. In materials science, you can also access information about processes such as nanoparticle synthesis and electrochemical deposition. In real world applications, the majority of materials environments involve some level of moisture, and with liquid cell TEM they can be investigated in a more realistic setting. 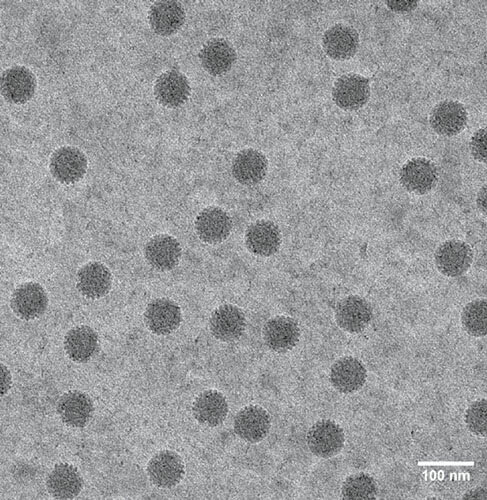 Rotovirus particles in liquid. Courtesy of Virginia Tech. Nansocale imaging in a TEM requires a vacuum for a precise beam of electrons. This small wavelength of accelerated electrons is necessary for high resolution imaging at this scale. However, liquid would usually vaporise in the high vacuum, so the sample has to be completely contained and sealed by the holder. 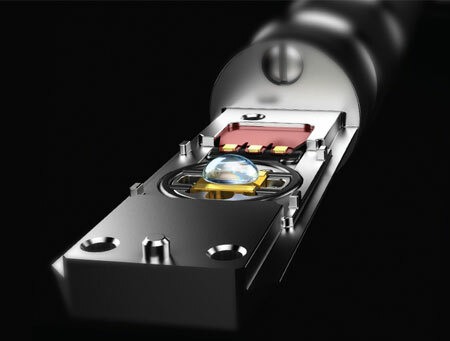 The holder itself is transparent to the electron beam, so your images retain the same level of detail, even in liquids. The holder also gives you the additional benefit of keeping live samples within your field of view in an an observable window. 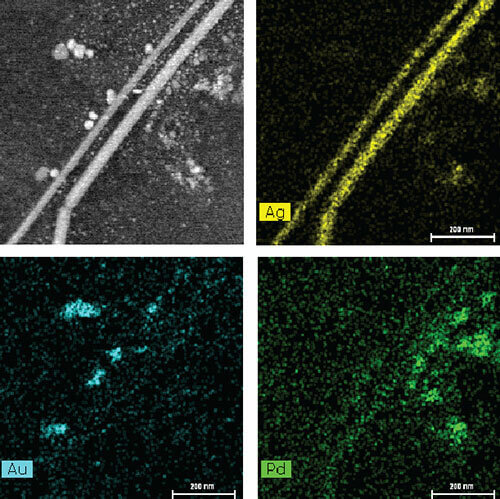 EDS (Energy-Dispersive X-ray Spectroscopy) is an extremely useful technique for studying samples with a TEM. You can determine their elemental composition, from characteristic X-rays that are unique to each element. In the past it was challenging to study samples in liquid environments using EDS. The closed-cell design, silicon chips and other materials blocked the X-rays emitted from the sample, so the unique information they contained couldn’t be collected. In-situ liquid TEM holders are now compatible with EDS. There is a direct line-of-sight between the sample and the detector, allowing X-rays to be collected and analysed without any obstruction. The holder is engineered to avoid shadows on the EDS detector and maximise CPS (Counts Per Second). EDS elemental analysis of nanoparticles in water. Courtesy Argonne National Lab. Aside from keeping the sample in a natural state, it’s also important to protect your microscope. TEMs are extremely expensive systems, and liquid leakage would be a serious problem. By using a dedicated liquid TEM system, you can ensure that the specimen is completely contained and sealed. While completely and safely encapsulated, the membrane is electron-transparent so it doesn’t affect the imaging process.